With the problems Blogger's been having, my last post, along with all the comments I received have disappeared, but they say they're working on getting all deleted posts restored, so here's hoping...and here's hoping this actually posts! If you know me personally, or if you've read my blog before, you'll know that Saturdays are usually my library day. I love the library, love books, love to read, love to wander the stacks, discover new authors, immerse myself in new worlds, etc, etc. I was going to start my own library theme until Katy from A Few More Pages very nicely informed me that Claire from The Captive Reader and Marg from The Adventures of an Intrepid Reader have a weekly theme called Library Loot, so I'm going to participate. 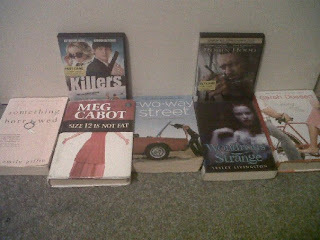 Somehow this week, I ended up with all young adult novels, except for Something Borrowed. Not sure how that happened, but I guess I'm on a bit of a YA kick since I'm writing a YA novel myself. Something Borrowed by Emily Giffin. I've had Emily Giffin on my author list forever, but never got around to reading any of her books. When I saw that Something Borrowed was coming out as a movie, I decided to read the book because I have a thing about reading the book before seeing the movie it's based on. Size 12 is Not Fat by Meg Cabot. A book I've had on my list for quite awhile. I read a couple of her Princess Dairies books back in the day and enjoyed them, and although I started one of her recent novels (I think it was Insatiable) and couldn't get into it, I thought I'd give her another try. Two-Way Street by Lauren Barnholdt. I saw this book reviewed on a few book blog sites awhile ago, and was curious. Wondrous Strange by Lesley Livingston. I've been looking into YA books about faeries for awhile because I've had an idea for a faerie book for a few years, and I think it'll be my next project when I'm done writing my current novel. I want to see what's out there, what's been done, and what hasn't been done so that I can do something fresh. Along for the Ride by Sarah Dessen. I read a few of Sarah's books when I was in my teens, and her novel Someone Like You remains one of my all-time favorites to this day. It's been a long time since I've read anything of hers, so I decided it was time to play catch-up. Movies: Robin Hood and Killers. I love tales of Robin Hood and one of my favorite movies ever is Disney's Robin Hood. I know this will be a far cry from the Disney version, and I might end up traumatized (like when I saw King Arthur after loving Arthurian tales my entire life) but I'm curious, and having Russell Crowe as Robin doesn't hurt. Killers was a movie I wanted to see in the theatre last year so I snatched it up when I saw the library had it. It's been about a month since I've read anything that I loved. I finished Wings by Aprilynne Pike tonight, and Nocturne by Syrie James yesterday, and I'll have book reviews for both of them posted in the next couple of days. I'm hoping one of this week's selections will be a new favorite - it's about time! Have you read any of the books I picked up this week? Have any suggestions for next week? I read just about every genre, and I'm always looking for suggestions! What are you reading, or what have you read lately that you really enjoyed? I remember being nervous about Robin Hood for the same reason, but once I watched it, I thought it took an interesting angle at the story. :) Great haul from the library! I love my library, though I've been too busy to get anything other than kids books for my 4 & 5 year olds lately.